My friend, Amanda (who I wrote about in this post), just sent our Kenya team an email about this new program The 410 Bridge is doing called Rafiki Mail. In Swahili, "rafiki" means friend (which you should probably know if you've ever seen The Lion King). I just found one of my sweet little Kenyan friends on the website. His name is Mutua and I met him during our trip to Ngaamba last October. 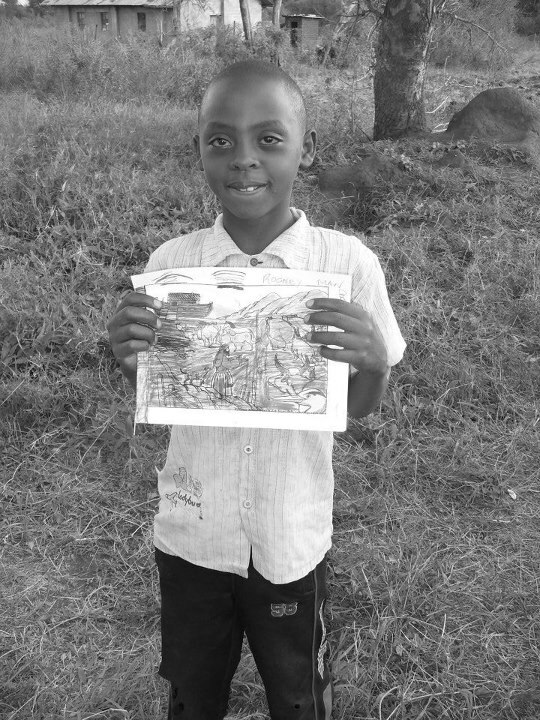 Here's one of the photos I took of Mutua one afternoon as we sat out in the churchyard coloring pictures together. The whole premise of Rafiki Mail is that we create our own account on the site and log in a few times a month to take a photo of ourselves holding up messages for one another. The 410 Bridge team on the ground in Kenya then takes these photos, travels all over to visit each village, and gives the pictures to the children who have been selected for Rafiki Mail. Then each student writes his or her own message. Afterwards, the 410 Bridge takes their photos and heads back to their headquarters to upload the photos to the site. That's a lot of work just to get a few messages across the world, but I couldn't be more grateful for the 410 Bridge and their dedication to these communities. They have a very special place in my heart. 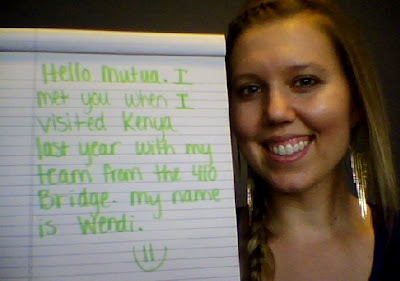 I can't wait to hear from you, Mutua! Hooray! (That is my excited noise! )This makes me so happy! I look forward to seeing what you and Mutua have to say to each other!